Cody Willoughby | Troy Daily News Hundreds of participants pace east on Main Street during the 15th annual Miami County Walk to End Alzheimer’s on Saturday in downtown Troy. 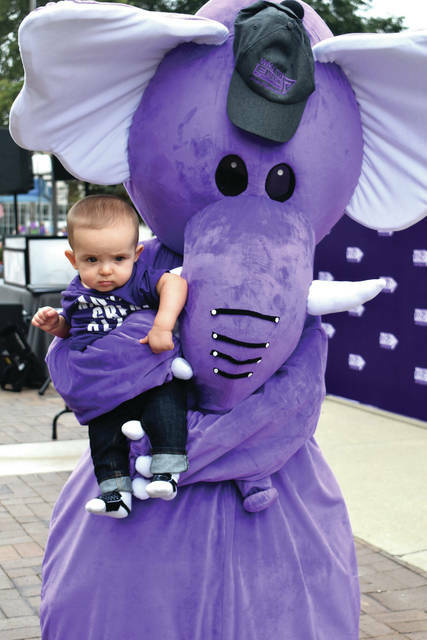 Cody Willoughby | Troy Daily News Olsen Clendenen, 7 months, of Miamisburg gets acquainted with Violet the Elephant during opening ceremonies at the Miami County Courthouse ahead of the 15th annual Miami County Walk to End Alzheimer’s on Saturday in Troy. Cody Willoughby | Troy Daily News Attendants participate in the “promise garden ceremony” ahead of the 15th annual Miami County Walk to End Alzheimer’s on Saturday at the Miami County Courthouse in downtown Troy. 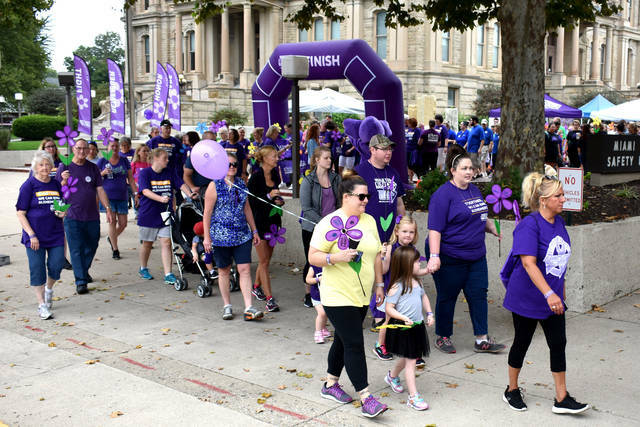 Cody Willoughby | Troy Daily News Hundreds of participants cross the starting line for the 15th annual Miami County Walk to End Alzheimer’s on Saturday in downtown Troy. 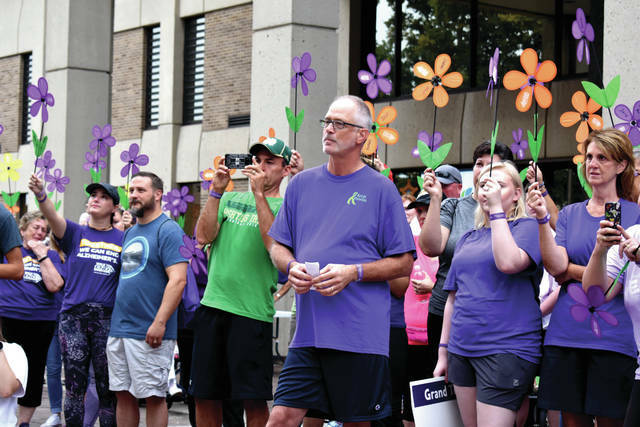 TROY — Hundreds of Miami County residents stood together against the tragic effects of Alzheimer’s disease on Saturday, as the 15th annual Miami County Walk to End Alzheimer’s commenced at the Troy Courthouse Square. The event was hosted by the Alzheimer’s Association Miami Valley Chapter of Dayton. Funds raised at the event will benefit the Alzheimer’s Association in their continuing efforts to fight the disease. Kathryn Hinds, mayor of Piqua, presented a joint proclamation from she and Troy mayor Mike Beamish, pronouncing Saturday, Sept. 15, 2018 as ‘Walk to End Alzheimer’s Day’ in Miami County, including the cities of Troy and Piqua. Before the walk, a “promise garden ceremony” was held, in which participants made a commitment to fulfill their promise to remember and honor their lived one fighting Alzheimer’s Disease. Each registered walker had a blue, purple, yellow, or orange flower, with each color representing their connection to the disease. While the 2017 walk attracted over 500 pre-registered participants, this year’s walk attracted over 700 participants, indicating a growing awareness of Alzheimer’s disease throughout the Miami Valley. The Alzheimer’s Association Miami Valley Chapter serves nine counties, including Miami County, enforcing care for over 30,000 people in the region living with Alzheimer’s. 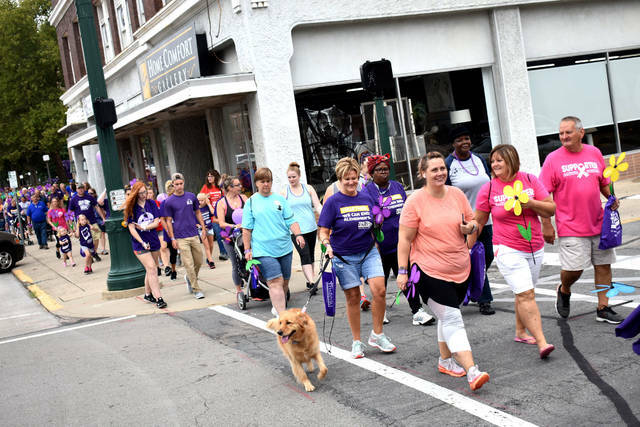 The chapter will host Walks to End Alzheimer’s events in Shelby County on Saturday, Sept. 22, the Springfield/Urbana area on Saturday, Sept. 29, and Dayton on Saturday, Oct. 6. The Alzheimer’s Association Walk to End Alzheimer’s is the world’s largest event to raise awareness and funds for Alzheimer’s care, support and research. Since 1989, the Alzheimer’s Association mobilized millions of Americans in the Alzheimer’s Association Memory Walk. The Walk to End Alzheimer’s is sponsored nationally by Edward Jones Investments and locally by Piqua Manor and Garbry Ridge. For more information, visit www.alz.org/dayton. https://www.tdn-net.com/wp-content/uploads/sites/21/2018/09/web1_Alz3-2.jpgCody Willoughby | Troy Daily News Hundreds of participants pace east on Main Street during the 15th annual Miami County Walk to End Alzheimer’s on Saturday in downtown Troy. https://www.tdn-net.com/wp-content/uploads/sites/21/2018/09/web1_Alz4-2.jpgCody Willoughby | Troy Daily News Olsen Clendenen, 7 months, of Miamisburg gets acquainted with Violet the Elephant during opening ceremonies at the Miami County Courthouse ahead of the 15th annual Miami County Walk to End Alzheimer’s on Saturday in Troy. https://www.tdn-net.com/wp-content/uploads/sites/21/2018/09/web1_Alz2-2.jpgCody Willoughby | Troy Daily News Attendants participate in the “promise garden ceremony” ahead of the 15th annual Miami County Walk to End Alzheimer’s on Saturday at the Miami County Courthouse in downtown Troy. https://www.tdn-net.com/wp-content/uploads/sites/21/2018/09/web1_Alz1-2.jpgCody Willoughby | Troy Daily News Hundreds of participants cross the starting line for the 15th annual Miami County Walk to End Alzheimer’s on Saturday in downtown Troy.